So today was very exciting as I got to pick up my first box of fresh produce through my CSA (community-supported agriculture) share with Peaceful Belly Farm here in Boise. So now for 17 more weeks, every Wednesday afternoon I’ll get to hop on over to a neighborhood host’s house and see what vegetable surprises await (actually they send an email out the day before telling us what we’re getting–it’s kind of a spoiler alert, but I know it will get me even more excited and I think it will be helpful in terms of recipe planning). Of course at that time I wasn’t planning on buying a house, but now that I have, I’m extra glad I had bought my CSA share as I won’t really be growing a whole lot in my garden this year. You all know I’m in the thick of the “demolition” phase with regard to my yard/landscaping/future garden spaces, so I think I’ll have to be content with just growing a few tomato plants (the first of which actually came in my produce box today, yay!) and surviving off the fresh organic produce that my wonderful farmers are raising for me. That sort of reminds me of whyI love being an aunt–I get to enjoy the fruits of my brother’s and sister’s labor (meaning, their kids, and her labor, literally, I guess…) without doing all the hard work of actually raising them. Ha! 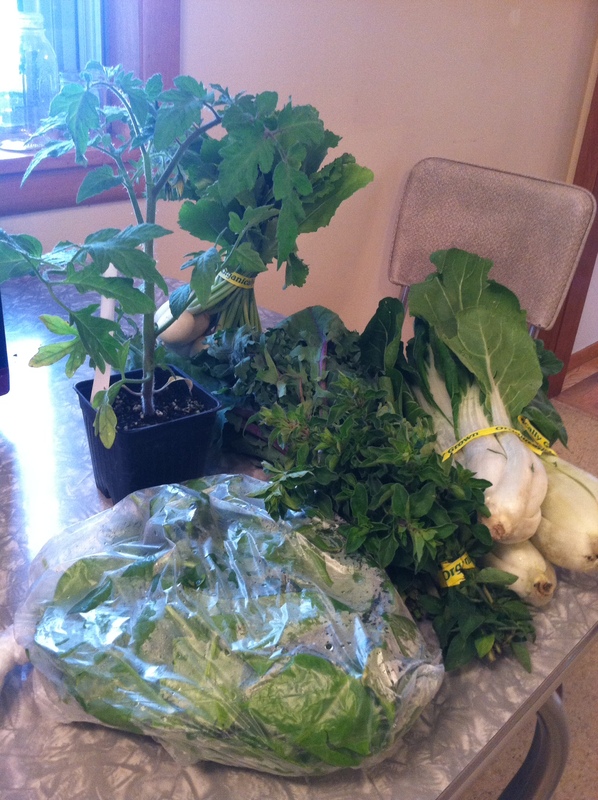 So my first basket included a bag of spinach (which I put in my smoothie every morning), a bunch of bok choy (which I’m going to have to figure out how to cook), a bunch of turnips (again, don’t think I’ve ever eaten a turnip), a bunch of fresh oregano, a bunch of kale, and as I mentioned, an heirloom tomato plant that purportedly will produce flaming orange beefsteaks weighing on average 9-12 oz. [Squeeeeeeeeal] I’m so excited! 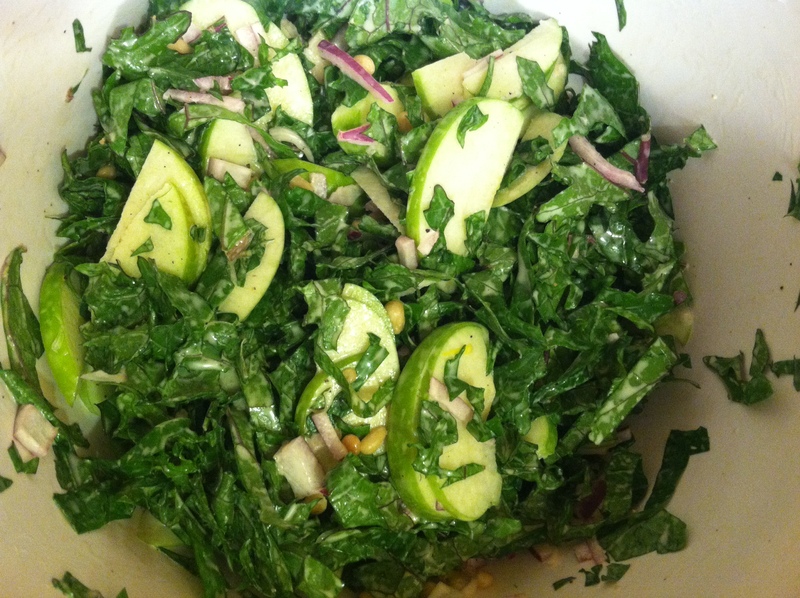 Shred a bunch of kale, slice or chop one or two green apples, slice or chop about a half cup of red onion, and add some nuts or seeds for crunch (I used pine nuts but I think almonds or sunflowers seeds would work well, or whatever you have/like). Mix the dressing: 1/4 cup mayo or yogurt, 1 T apple cider vinegar, 1 tsp sugar or agave/honey, juice of a lime, and some salt and pepper to taste. Pour dressing over the fresh ingredients and toss it all around. Proceed to wolf if down, because it’s super yummy. The dressing is pretty light too, so don’t be surprised or ashamed if/when you eat the whole bowl in one setting. Be creative and add whatever needs to be used or what you think would taste good. The dressing is a bit sweet like old-fashioned coleslaw dressing. It would be good with some thin slices of radish (hint, hint, for all you “full-share” CSA folks out there…) or thin shavings off a fennel bulb.